Iran's recent presidential election received much more hype in the news than was really warranted. The two candidates, incumbent Mahmoud Ahmadinejad and Mir Hossein Musavi, were not that far apart on their positions, despite the "moderate" label that some analysts had attached to Musavi. Musavi is not really a moderate, he is merely slightly less radical than Ahmadinejad. He did rally a lot of people to turn out and vote - many of his supporters were hoping that his election would result in the end to the so-called "morality police" and a less strict interpretation of Islamic social rules. The apparent re-election of Ahmadinejad has triggered demonstrations by Musavi's followers against what they believe was a rigged election. 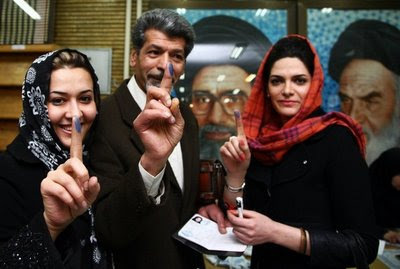 I have no way of knowing if the election was rigged, but the overwhelming reported results would indicate that Ahmadinejad probably did win, although maybe not by the huge margins claimed in the official tally. The election of the president in Iran is not the same as the election of the president in the United States. The American president is the commander in chief of the armed forces and the head of government. Ultimately, all government agencies in the executive branch - which includes the intelligence services and police - fall under the authority of the president. In Iran, the president does not have these powers. He can sign treaties, appoint officials and manage some domestic affairs, but the real power in Iran is vested in the "Leader of the Revolution" (more commonly called the Supreme Leader), Ayatollah Ali Khamenei. The Supreme Leader has almost absolute authority - he can dismiss the president, overrule legislation, commands the armed forces and the Islamic Revolutionary Guard Corps, and controls the intelligence and security services. Although he theoretically is supervised by the Assembly of Experts, this body of elected clerics has never even spoken against the Supreme Leader. The demonstrations will continue for a short period of time. While Musavi and the demonstrators want the Supreme Leader to reject the elections and call for a new vote, it is not likely to happen. Khamenei wants Ahmadinejad in the presidency, and that's the way it will be. Trying to predict what happens in Iran is difficult. I, and many other analysts, have been predicting the demise of the Islamic Republic for years. For the past 15 years, I have been saying, "Within five years, the Iranian people will have had enough of the mullahs and get rid of them." At some point, I believe that will happen. I just don't think this election will be the catalyst.